This week our trade of the week features a global multinational business designing, manufacturing and supplying wearable medical grade devices being sold through e-commerce platforms. The multinational traded consolidated invoices valued at €568K raised to French based global ecommerce debtor within 24 hours. This week our trade of the week features a global multinational business designing, manufacturing and supplying wearable medical grade devices being sold through e-commerce platforms. 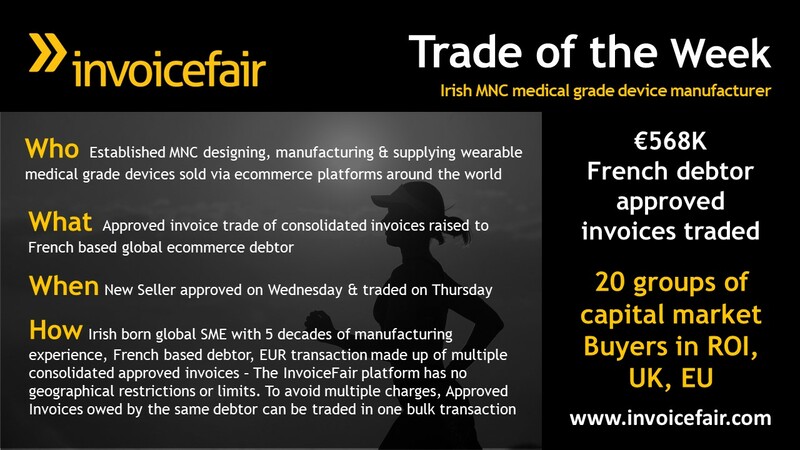 This trade demonstrates the speed and flexibility of the InvoiceFair Platform. Approved on Wednesday, The multinational traded consolidated invoices valued at €568K raised to French based global ecommerce debtor the next day. The consolidated invoices were purchased by 20 groups of capital market investors.